Necessity is always the mother of invention. I have been puzzled for quite sometime with two issues in my home. I have a central heating system that can turn my 2nd floor into a sauna while my 1st floor feels like an igloo. My other issue is how sounds carries in my home with hardwood stairs. It is impossible to watch a movie with someone asleep upstairs. After much contemplation, I gave birth to this idea. A very creative, functional, and decorative way to increase your home’s warmth is by using insulation panels. 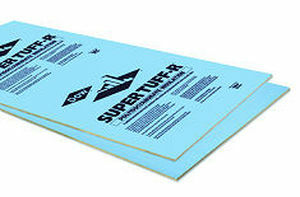 You can find large 4’x8′ panels of foam core insulation at your local home improvement store. The thickness of the panels will depend on your preference of “R” value for the insulation. The panels are very easy to cut to size by using a handheld saw, or some stores will cut the panels to size for you. Once you have your panels ready, you can be creative in upholstering them. My vision is to having 4 panels of equal size to hang in a linear fashion on a feature wall. The panels would be upholstered with a solid, and then an accent strip horizontally. Not only will this lower heating bills, but will also dampen sounds in the room if your home tends to echo sounds. 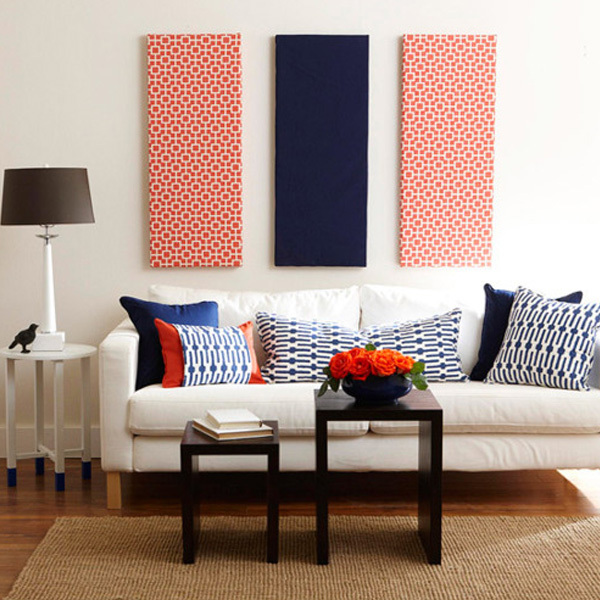 If you want to really be creative, you can cut the panels into a more intricate design, and layer fabric to use a focal art piece in your home. A perfect fabric to use for the solid background would be a twill or a linen. These fabrics are easy to work with, and can easily withstand pulling and tugging during assembly. Ko569 Linen could be an exceptional choice as a neutral shade with a touch of texture. 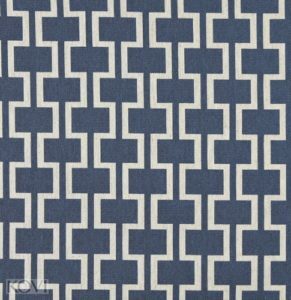 Geometric fabrics are increasingly popular for interiors. The Tempo Collection has many beautiful choices to peak your visual interest. K2203 Peach Tile is a favorite of mine for this project for the center panel. I’m even considering how cute a wood monogram would look on this pattern. The possibilities are endless with fabric selections that Kovi fabrics can offer this project. The only limits are your imagination and your budget. Here are some great geometric patters that may work for you! As for the results of my project, my husband has raised his eyebrows with intrigued at my ingenuity. Yes, and it worked. The sound is dampened to an acceptable level, and the panels have knocked the chill off the downstairs, especially on blustery nights. In the near future, I may hang a few in my stairwell to feature pictures, and dampen the sound a bit more. In short, my crazy plan worked, and I am very satisfied with the results!